After a recent off I’d like to suggest the Renntec drop bars. Bike was spinning latitudinally, not endo. Was probably doing about 50km/hr (30mph) when it hit the ground. The drop bars stopped any engine case damage. They also make fine mounts for lights, camera, etc. They are also handy in the workshop. They are also handy in the workshop. Those Renntec bars look almost unscathed. Good to see the Aldi gear worked also. There are two different engine bars which are dependent of the year model FJ you have. They do work great. I know of one forum member who has tested his set out three or four times. Each time there has not been any engine damage sustained. Follow the doctors orders and take the proper time to heal, it will benefit you more in the long run over rushing it. Yep, I was present for 3 of the field tests from one owner (same set of bars) and the FJ was ridden home by the owner (proper gear for rider and bike). He did mention needing to weld up a few thin spots. I can also attest personally to the benefits from a low speed drop and a few zero speed tip overs. Saved my engine during a 20+ yard slide down the highway about 12 years back. Do the bars make raising a dropped bike any easier? To keep the scenario simple: dropped on level asphalt, is the bike laying at a slightly higher angle so getting started to upright it is any less initial grunt? The bars did not seem to help much when I picked mine up. But the ability to ride it after, was worth the investment. I overbalanced once at a petrol station. A slow and gentle lay-over, I managed to kick the rear peg out and made sure the handlebar was turned to straight, the drop bars kept everything off the ground. 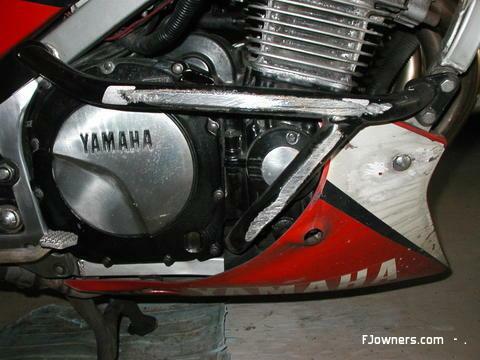 There were three points of contact, the drop bar, rear peg, and the tip of the handlebar. The Renntec made it a little harder to get started, but easier once moving as it acted like a fulcrum till the wheels took over. Aside from a tiny nick on the bars, not a mark on the bike, including the mufflers!!!! If you're struggling to lift a bike, turn around, squat, and lift with the bike behind you till it is upright enough so you can turn around whilst keeping it steady. I saw a YT vid, I think from the forum, of a lass lifting a BMW. I tried it myself for laughs after a workshop whoopsie (the not so funny part) & yep, much easier, but you do have to think about it a little more, and go a bit slower. Had a look at mine (that aren’t fitted) to fit and they seem to rest up against part of the lower frame, Will this over time get rub marks and how could I stop this. Al, I fit them to all my bikes as I'm an idiot and they don't wait for me to be stupid, they are ready.